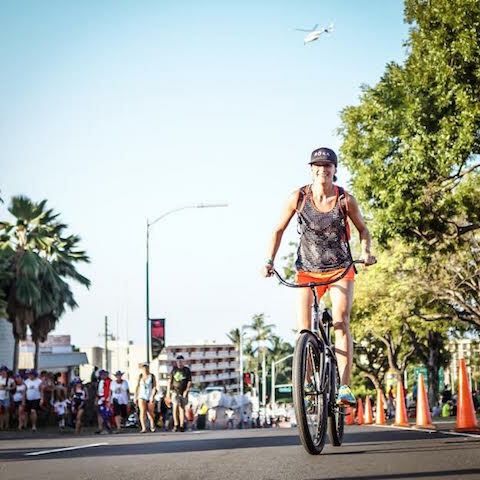 I decided to partake in this year's Ironman World Championships from the OTHER side: volunteering, spectating, commentating, cheering & socializing. So, what was it really like to watch the Ironman World Championships? I knew I was going to watch the race whether I was at home or in Hawaii. I am a huge fan of triathlon - sidelined or not. I have never watched Ironman Hawaii and wanted to use my circumstance to learn as much as possible, represent my sponsors race week, and make the most of the situation. There were parts that I loved, and parts that were challenging. In the end, the positives outweighed the lone Debby Downer party I had on Thursday of race week and I am happy I went. I'd recommend it to anyone in a similar position. 1. It's pretty freaking awesome. I said to Chris one morning watching the kazillions of fit, lean, strong & tanned athletes run past our condo pre-race, "This has to be one of the largest congregations of the most fit people in the world in one place at one time." 2. Pressure. You could cut the tension with a knife on our plane flight in. You can see it in all the athletes eyes: driven, focused, serious. The amount of pressure and emphasis that I saw placed on this race was incredible. Being on both sides of the fence now, personally, this is something I hope to alleviate moving forward. My hope it to treat Ironman Hawaii like JAR = Just Another Race. The truth is, Kona is just another Ironman - it just happens to be really tough and have a World Championship attached to it's name. 3. Nutrition & pacing matters. No questions here. The athletes that nailed their nutrition plans did great. There was a lot of suffering on the Queen K during the marathon. A large portion of these mistakes came from not fueling properly, mis-pacing and overheating. These are mistakes that are super challenging to rebound from, particularly in Kona due to the harsh conditions. This was really evident the last 15km of the run. If you can get to the last 15km of the marathon prepared to be running - or at least moving forward in a reasonable matter - you'll make up a ton of time on others. 4. Put your blinders on. In the professional field, a few athletes in particular had incredible days due to racing with blinders on (or at least it appeared that way). I noticed that all day they were calm, collected and most importantly appeared to be in control. Neither of them were affected by what their competition was doing, where they were at in the field, or splits to the lead. They were focused on themselves all the way to that line and ended up with some nice umeke bowls (top-10 finishes). 5. It was a hot marathon. The conditions this year were really hot. I wasn't far out on the bike course, so I can't speak for the winds, but it appeared to be not as windy and hotter-than-hot with zero cloud cover for the marathon. This changed the dynamics of the race compared to the past few years where we have seen a bit of cloud cover on the run. 6. Kona takes no prisoners. The best way I can describe Ironman Hawaii is that it is like drawing from a deck of cards - everyone goes in with a blank slate and you really don't know what hand you will get. I felt really bad for some of the professional athletes that I know personally, to see their days ended early or badly due to unfortunate luck, bad mechanical juju, the elements taking over, etc... Kona doesn't seem to discriminate when it comes to success or bad races. 7. Spectating is fun. Witnessing the spirit of our sport: athletes suffering, pushing limits, feeling personally challenged and then rebounding (sometimes multiple times throughout the day), the support of others carrying you in times of need, competitors helping fellow competitors, champions rising, champions falling, acts of resiliency, tenacity, grit & grace. This. This is what it's all about. Thank you to everyone that shared a part of Ironman Hawaii, 2015. I got on a plane Sunday feeling fired up and motivated to join the multitude of others on that start line in 2016.